Can Vancouver's "EcoDensity" plan help make housing more affordable? I sort of hoped that the term “EcoDensity“—a word coined to describe Vancouver’s plan for new development within city limits—would grow on me. But it still sounds pretty clunky to my ears. That said, it’s a pretty apt description. If the greater Vancouver region is going to add more residents over the next few decades—as seems pretty much inevitable—by far the most environmentally friendly path is to create more housing in places that are already developed. The alternative is to put more people in places that aren’t developed—“greenfield” development on farmland and open space—which can create all sorts of fiscal problems (see, e.g., this interesting lit review) as well as environmental ones. Sure, when people see high-rise condos or big apartment buildings, they don’t often think of “unspoiled nature.” That’s understandable. But it’s also an error: person for person, living in a high rise neighborhood (or a similar compact community) can help dramatically reduce your environmental footprint—particularly for energy, since you’re sharing walls (and heating bills) with neighbors, and often can drive less to get to stores, services, and jobs. The aim of the EcoDensity plan is to spread new, denser development across the city, not just in the downtown core. That could bring some of the benefits of density—easier access to stores and services, frequent and cost effective transit service—to even more Vancouver residents. But, to some people, the big issue in this plan has nothing to do with the environment. Instead, it’s all about the housing market—and in particular, whether EcoDensity will help make Vancouver’s housing more affordable. The proponents of EcoDensity claim—I think, with a lot of justification—that boosting new development within Vancouver city limits will help ease housing costs. That makes perfect sense to me: if high housing costs are caused by too much demand and too little supply, then creating more housing should ease the crunch, no? Coun. Heather Deal of Vancouver civic opposition party, Vision Vancouver, said she’s not convinced that taller buildings will reduce the price of a new home. “I don’t think that each new tower that goes up downtown is selling for less than the one before it. In fact, quite the opposite. There’s part of me that thinks of this as nonsense: higher prices were exactly what you’d expect given enormous demand focused on relatively modest increases in supply. If new buildings hadn’t opened, wouldn’t all that demand have been focused on an even more constrained supply? But there’s another part that understands the point. Vancouver has become incredibly attractive, not just to new residents, but also to investors and real estate speculators, and even to wealthy Americans looking for a pied a terre in a vibrant and urbane city. Adding to the supply of high-rise housing may actually be exacerbating that trend—fueling the thirst for new housing, rather than slaking it. I don’t really think that’s right, but I don’t actually know for sure. Regardless, it seems like the opposite of the EcoDensity plan—essentially, making it harder for developers to increase the supply of housing within the city —would do nothing to ease the high cost of new housing in Vancouver. So count me (provisionally, at least) as someone who believes that EcoDensity will kill two birds with one stone—reducing Vancouver’s per-capita environmental impacts and its housing prices in one stroke. When you make a community as attractive as downtown Vancouver market forces take over. Investors follow trends and than can exacerbate price trends. Construction costs have also outpaced inflation. Successful communities can be victims of their own success. Vale, CO or Roslyn, WA are also good examples. I’d like to know if Vancouver’s planners saw this coming or were surprised. 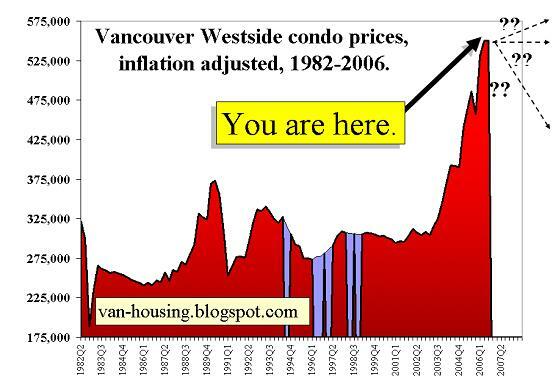 I’d like to know if Vancouver’s planners saw this coming or were surprised.They saw it coming. When you provide amenities, people want them and bid up rents to get them. That is the problem with walkable communities wrt affordable housing: they don’t mix. That is also the problem with many New Urbanist and TND developments (and cottage housing too) – so many amenities are tacked on to make the development attractive that affordability goes out the window because the prices get bid up. We all know it but are seeking ideas to solve the dilemma. If anyone has the solution, I guarantee you’ll be a millionaire. .
You could mill all that pine in eastern BC that is being killed by bark beetles and get cheap wood and export out. Guaranteed you’d never run out of wood…Hmmm…instead of FAR you zone for BAR [Body Area Ratio]. Never thought about that. Hmmm…not sure that would be enforceable. How about just a variety of apartments, 600/800/1000 sf and let tenants figure out what is enough space? I like the 600/800/1000 idea. The simpler the better, otherwise we build a bureacracy around counting bodies.At my Mom’s coop the units under 700sf are valued low and larger units fetch more $ per sf. (http://www.silverglen.org/price_list.htm) A developer would want to skew big. At a modest jump up in square footage it normalizes. However I’ve heard that 4-500 sf studio condos downtown and around greenlake are now selling well. I totally support urban density for community and economic vibrancy, housing affordability and convenience, and ecological well being. My concern is with the current thinking that tall and very tall buildings are the way to go to achieve ecodensity. What is the process for determining what is the most sustainable height/density for an area? The one study I am familiar with, GOA 2100, offers one template of how to approach this issue of the optimum density and height of buildings in an area using a wide array of criteria and the answer for their study area is a maximum height of 6 stories. As someone who grew up on the 21st floor of a building, I can tell you that when the power goes out, 6 stories sounds a lot more livable than 16. (When I mentioned this to a local architect of a 16 story tower near my home, he said, “Oh, you want to live in Paris.” Well, yeah! )At a certain height buildings start requiring another level of energy input to deal with all the impacts of the mass of the building. I would be interested in seeing the ecological footprinting for buildings at different heights. In terms of Portland, approximately 80 percent of the city is zoned for single family housing and currently there is a restriction of accessory dwelling units to only 33 per cent of the size of the main dwelling unit (plus other set back and lot coverage requirements.) So if you own a reasonably sized home of 900 sf, you can only build a 300 sf ADU. If we simply removed this 30 per cent rule (while keeping all the lot coverage and set back requirements), there would be a possible doubling of the density for a majority of Portland that could be done on a small scale basis with the development benefits going to individual home owners. That along with 6 story development around transportation nodes, and I wonder if we might not be able to address the density and affordability issue at a what I see as a more human scale. Excellent, points, Beth.One of the unsung victories in Vancouver in recent years was the legalization of accessory rental units in single-family neighborhoods. Some observers believe that Vancouver’s success at maintaining population density in its single-family neighborhoods, without disrupting their architectural feel, is as important as the city’s ultra-urban core. This seems to me an apt moment to recall one of the better ideas mooted for further densifying Vancouver. This is Patrick Condon’s suggestion that four-story buildings be constructed on the lots fronting the former street-car routes (where the zoning is for the most part already in place as this was the development envisioned at the time). Apparently, “you could almost double the population of the city while not changing the amount and nature of the commercial services on the first floor,” as can be read in this earlier Daily Score posting, which also links to the original article in the Georgia Straight. Thanks to Erin Conroy for supporting a sustainable Northwest.